Spanish Colonial. Santa Domingo. ca. AD 1540's to 1550's. AE 4 maravedes. First Coin of the Caribbean. Dealer lot of 3 coins. The three coins in the image are the three coins you will receive. The price is for all three coins and averages $26.00 per coin. Santa Domingo was the first mint set up in the Carribbean Islands, and the second Mint in the New World (preceeded by Mexico City by 2 or 3 years). 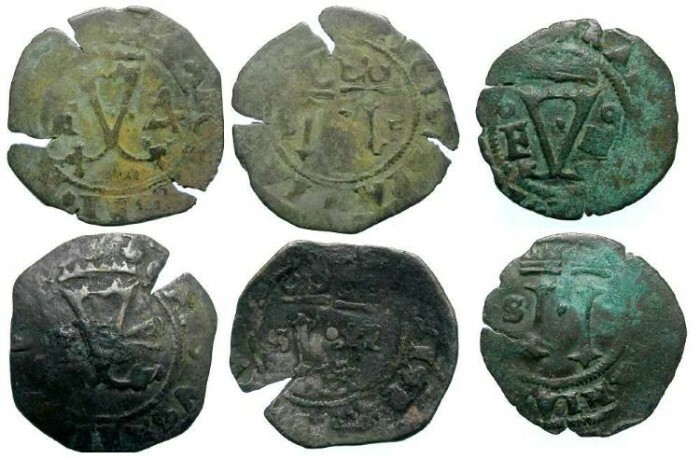 Since the earliest issues from Mexico City are nearly impossible to locate, the copper coins of Santo Domingo represent the earliest New World coins the average collector can include in his collection. Denomination : AE 4 Maravedes. Date : Struck during the reign of Carlos and Joanna of Spain, who ruled from 1516 to 1556. These particular coins were struck between 1542 and 1556. Reference : C&C (1976) 826 to 829. Size : averae 26 mm. Weight : average 3.1 grams. Grade : Average Fine to VF with some encrustation. Crude strike as is usual for this type. Obverse : Gothic Y with CAROLVS ET IOANNA around, but only fragments of the inscription will be visible. The Y is flanked by an F and IIII to the right, both of which are below pellets. Reverse : Two crowned pillers, with mint marks S to the left and P to the right, with REGIS HISPANIARVM E I around, but only fragments of the inscription will be visible. These coins are from a hoard found on the Island of Jamaica in 1973, but do not have the countermark or countermarks often seen on these.